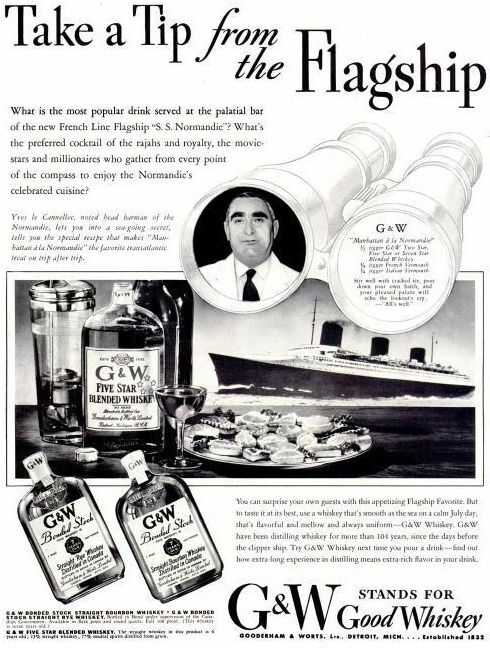 G&W stands for Good Whiskey (and many other things, as you’ll see in future ads), but it legally stands (or stood) for Gooderham & Worts, Ltd., a Canadian firm that manufactured spirits in Toronto for nearly 170 years, before the distillery closed down in 1990. In its time, it was the largest distillery in Canada, but it appears to have fallen victim to acquisition and consolidation. In the early 20th century, it was bought out by Harry C. Hatch, who just a few years later bought Hiram Walker. The Normandie has a great story. Built as a passenger-carrying ocean liner, it traveled from La Havre, France, to New York City. Upon commission, it was the largest ocean liner in the world but held that distinction only for one year, when Cunard’s RMS Queen Mary debuted. In its time, the Normandie carried Hemingway, Noël Coward, Irving Berlin, Fred Astaire, Walt Disney, and Jimmy Stewart. The Normandie just happened to be docked in New York shortly after France fell to Germany, and the United States seized the ship and conversion work began to turn it into a troop-transport vessel. During that work, however, the ship caught fire and was eventually scrapped. I find this ad, from the November 30, 1936, issue of Life magazine, very evocative. I can imagine myself surrounded by swells, my belly up to the bar, and ordering a cocktail.